The patented PowerBrace™ System, provided by Foundation Supportworks of the Tri States, is your foundation solution for reinforcing foundation walls that are bowing, buckling or tilting inwards. 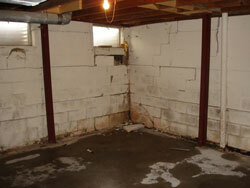 If you have a failing foundation and would like a FREE foundation repair estimate, call or contact us today! We proudly serve areas like Quincy, Pekin, Galesburg, Burlington, Ottumwa, East Peoria, Hannibal, Macomb, Canton, Oskaloosa, Fort Madison, Keokuk, Fairfield, Mount Pleasant, Monmouth, Washington, and the surrounding areas in Iowa, Illinois, and Missouri. When foundation walls fail due to outside soil pressure, cracks can form and the entire wall begins to creep inward. Constant expansion and contraction of the soil outside of foundation walls can create cracked or bowed basement or other subterranean walls. Unless stabilized, it can become irreparably damaged. The PowerBrace™ utilizes the natural strength of your building's concrete floor and floor joist, providing an economical foundation wall reinforcement option. The innovative design of the PowerBrace™ adds strength and support to your foundation walls, eliminating the possibility of basement wall movement. During installation, heavy duty, zinc plated steel beams are cut and fitted to match the height of your foundation. Each beam is secured tightly against the wall, using rugged steel brackets that anchor to the floor joists as well as the concrete basement floor. These steel reinforcement beams are warrantied to stabilize your foundation walls in their current position -- with no further adjustment required. However, if you'd like your foundation walls to be restored to their original position, a unique, patented design allows the PowerBrace™ to be tightened further during dry seasons, giving the unique opportunity for possible wall improvement. Old, rusty, failing foundation wall reinforcing in a Clark and Lewis counties, as well as Hancock, Adams, and McDonough counties home. Typical steel beam systems provided by foundation reinforcement contractors are created with black, uncoated (or painted) steel. 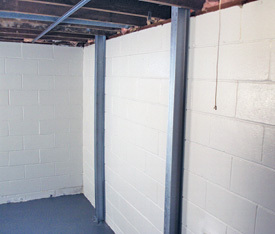 These exposed, unprotected steel beams will easily rust and corrode, creating an unsightly look in your basement space and leading to potential health problems. To protect the system from corrosion, all components of the Supportworks PowerBrace™ System are zinc-plated in accordance with the American Society for Testing and Materials (ASTM) B633 standards for zinc coatings on steel. This protective plating ensures the long life span and quality that Foundation Supportworks of the Tri States backs with our 25-year written warranty. Have questions? Just ask us! Rust is iron oxide, and when it gets in your bloodstream, it's just as bad for you as ingesting iron. Accidental iron poisoning is the leading cause of poisoning deaths among young children. Rust also provides the perfect habitat to harbor the dangerous bacteria C. tetani which causes tetanus. Tetanus produces many harmful effects, such as muscle spasms, difficulty swallowing, and elevated blood pressure and heart rate. When you decide it's time to stabilize and reinforce your foundation walls to prevent further bowing, buckling, or tilting, Foundation Supportworks of the Tri States of Iowa, Illinois & Missouri can help you by providing a FREE foundation repair quote. A free written estimate for all work. Customer testimonials and references are available, and all our work and products include a written warranty. Installation of our wall systems can usually be completed in a single day. We are your local experts for residential and commercial foundation repair! If you live in the areas of Clark and Lewis counties, as well as Hancock, Adams, and McDonough counties or nearby, contact us today! Step 1: Measurement of wall height. The PowerBrace™ is cut to an appropriate length. Step 2: The steel beam is fastened at the top to the floor joists. Step 3: The PowerBrace™ beam is plumbed. Step 4: The steel beam's bottom is anchored to the concrete floor. Step 5: Periodic tightening of the PowerBrace™ creates an opportunity for possible wall improvement. Step 6: Your foundation walls are reinforced!